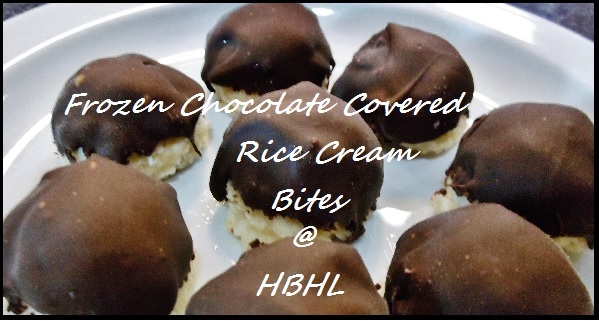 Yep, I said "Rice Cream"
My son came home with some of those crunchy chocolate covered ice cream balls the other night. Somehow. . . my kids always come home with treats whenever they run errands with my hubby. Sometimes they fight over who gets to run errands with him! Forever on my quest to create healthier sweet treats, I tried to come up with an ice-cream substitute recipe. I thought that if I could put cooked rice into a food processor with honey and vanilla extract I could make a sweet "dough" that could be frozen and covered in chocolate. I've never made or eaten rice pudding. I would imagine maybe this would kind of taste like rice pudding, but it's definitely thicker because I didn't add any milk or cream at all. It does have one little tablespoon of butter, but that's the only dairy. If you like coconut oil, you could probably add coconut oil instead or just leave the fat out altogether~~'cause the really fatty part is in the chocolate coating!! I used a heaping tablespoon of chocolate peanut butter in the chocolate coating, but you wouldn't have to. You could just use straight chocolate or you could add a little crisco, butter or coconut oil. I find that it covers a little easier if you add a little something to the chocolate once it's melted. One of my friends who bakes cakes as a side job (thank you for that tip, Christy!) taught me the thing about adding Crisco to the melted chocolate chips! What made this recipe even simpler was the fact that I used my quick-cook brown rice from Aldi. Bring 1 cup water, 1/2 tsp. salt and 1 Tbsp. butter to boil over medium high heat. Add rice, reduce heat to low, cover and simmer for 5 minutes. Take pot off burner when 5 minutes is over and let sit for 5 minutes. When sitting time is over, remove lid and fluff with fork. Let sit for 30 minutes to cool. When "cooling" time is over, add the rice, honey, vanilla extract and 1/4 cup water to bowl of food processor. Blend on the puree function until it's pretty smooth, stopping to scrape down sides if needed. I pureed for about 2 to 3 minutes total. The rice mixture will still be a little lumpy. Remove the rice mixture to a small bowl, cover with plastic wrap and put in freezer for 1 hour, stirring the rice mixture after about a half hour. Take the rice mixture out of the freezer and use a cookie scoop to make little balls. Place balls on a cookie sheet and return to freezer for two hours. I sprayed my bar pan with cooking spray just in case before I put the rice balls on it. This makes 25 balls with the normal small sized cookie scoop. Time to melt the chocolate! Place chocolate chips in a microwave safe bowl and heat on high 20 seconds at a time until melted. Stir after each 20 second interval to see if it's melted yet. It took mine about 1 minute total. When it's melted enough that the chips are smooth when you stir it, add the peanut butter and coconut oil. Stir until smooth. Use small tongs to pick up your frozen rice balls and dip them into the chocolate upside down so that the chocolate covers the round part (not the flat part) and place chocolate covered rice cream balls back onto the cookie sheet. When you've covered them all, place the rice cream balls back into the freezer for 30 minutes. When the 30 minutes is up, take them out and enjoy! Aaaaaaaaas usual in my family, Future Fashionista and I loved these, my son didn't like them and my hubby wouldn't even try them because "he doesn't like sweet stuff." Plus, he's just having a long, hard, busy week and that was the night we were rushing around trying to make it to the 2nd grade concert. "Everybody LOVES these treats! It is statistically impossible for everyone to love anything." I loved them, but I'd probably eat just about anything that's covered in chocolate.